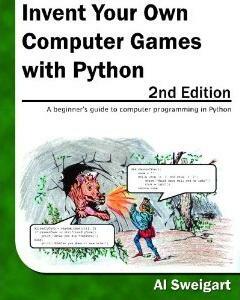 Invent Your Own Computer Games with Python (or IYOCGwP “eye-yawk-gwip”) is a book (hopefully a series of books) that teaches Python game programming for kids in the 9 to 12 year old age range. Instead of teaching principles and concepts, each chapter has a complete example of a game and its source code up front, and then provides explanation for the code. The book is freely available to copy and distribute for non-commercial purposes under a Creative Commons license. Any feedback or comments would be greatly appreciated.